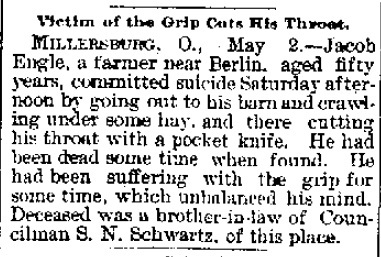 MILLERSBURG, O., May 2 – Jacob Engle, a farmer near Berlin, aged fifty years, committed suicide Saturday afternoon by going out to his barn and crawling under some hay, and there cutting his throat with a pocket knife. He had been dead some time when found. He had been suffering with the grip for some time, which unbalanced his mind. Deceased was a brother-in-law of Councilman S. N. Schwartz, of this place. “Victim of the Grip Cuts His Throat,” Hamilton Daily Democrat (Hamilton, Ohio), 2 May 1892, p. 1, col. 2; digital image, Newspaper Archive (http://newspaperarchive.com : accessed 11 January 2014). 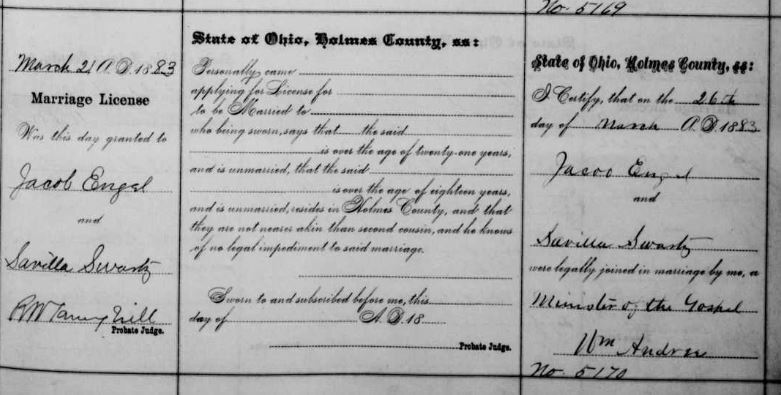 Not much is known about Jacob prior to his marriage to Savilla Schwartz on 26 March 1883, Holmes county, Ohio. 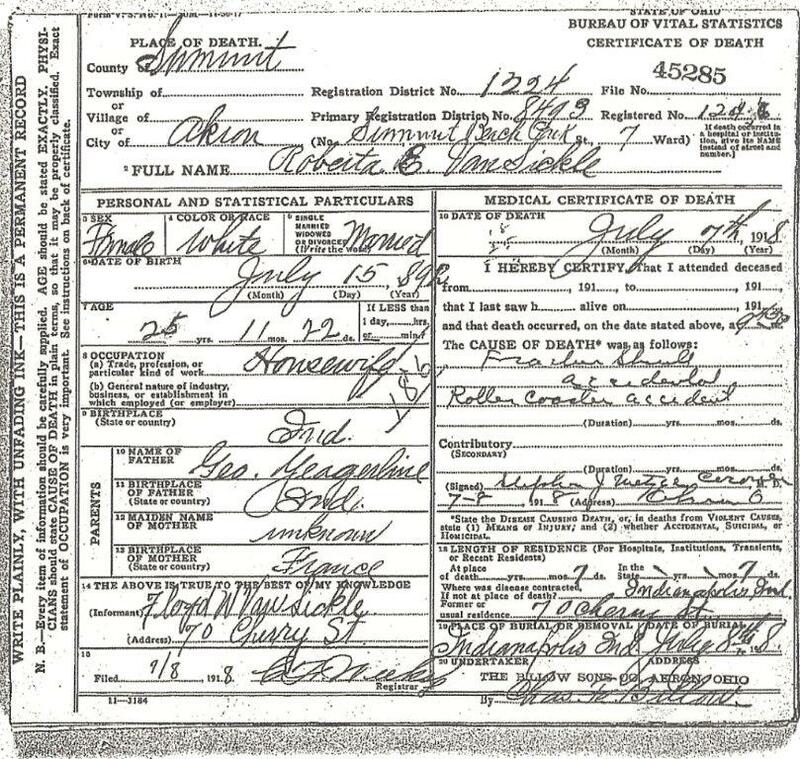 He was born in Germany (or Ohio) in the late 1830s. Sources differ as to his exact age but it was likely close to 1839 or 1840. He appears to be the son of Jacob and Margaret Engle. 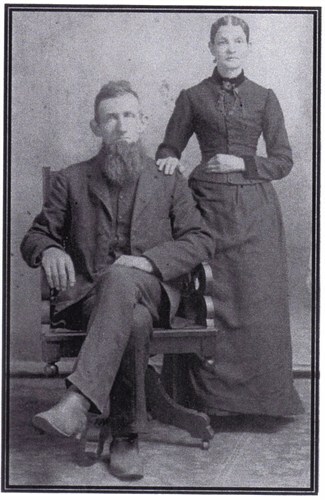 Jacob Sr. named his children, Jacob and Caroline, in his 1890 will. Both Jacobs were recorded as stone masons on the 1880 census. 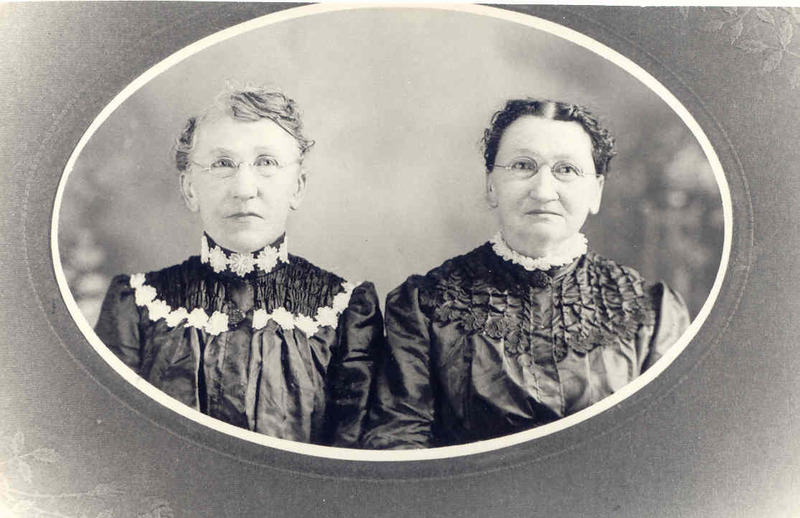 Jacob and Savilla had four children: Edith, Louisa, Henrietta and Jacob Franklin. The youngest was born 3 weeks after Jacob took his own life. Jacob is buried at Berlin Cemetery, Berlin, Holmes county, Ohio. 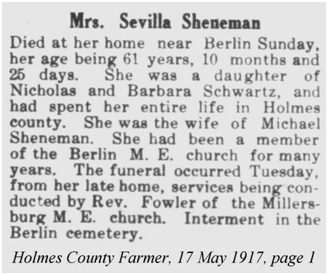 This entry was posted in Sunday's Obituary and tagged Jacob Engle, Samuel N. Schwartz, Savilla (Schwartz) Engle Sheneman on January 12, 2014 by Deborah Sweeney. After an illness of more than a year with a heart ailment, Frank Yagerlehner, a resident of San Rafael for 25 years, died Saturday at his home here. He was an employee of the Northwestern Pacific Railroad Company. 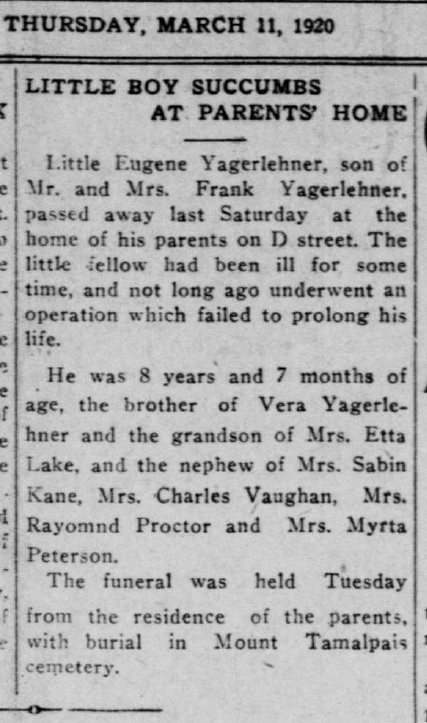 Yagerlehner leaves a widow, Mrs. Lottie Yagerlehner; a daughter, Mrs. L. M. Roberts, and a brother, Wilson Yagerlehner, of Long Beach. Funeral services were held Tuesday afternoon at 2:30 at the parlors of Keaton & Dusel here, with Rev. John J. Canoles, pastor of the Presbyterian Church, officiating. Yagerlehner was a member of Tamalpais Lodge No. 60, Knights of Pythis, and members of that organization held a brief ceremony Monday evening at Keaton & Dusel’s in memory of their departed brother. 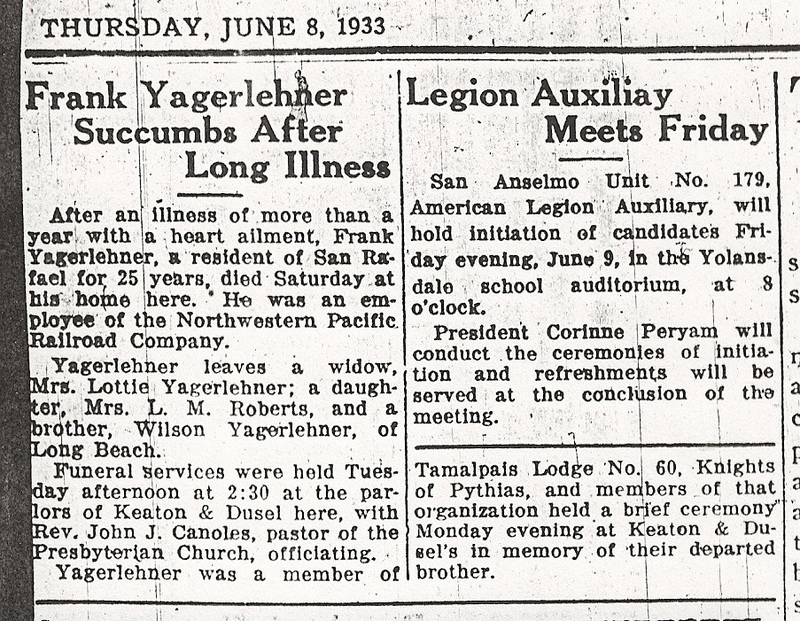 “Frank Yagerlehner Succumbs After Long Illness,” The Marin Journal (San Rafael, California), 8 June, 1933, p. 3, col. 1. 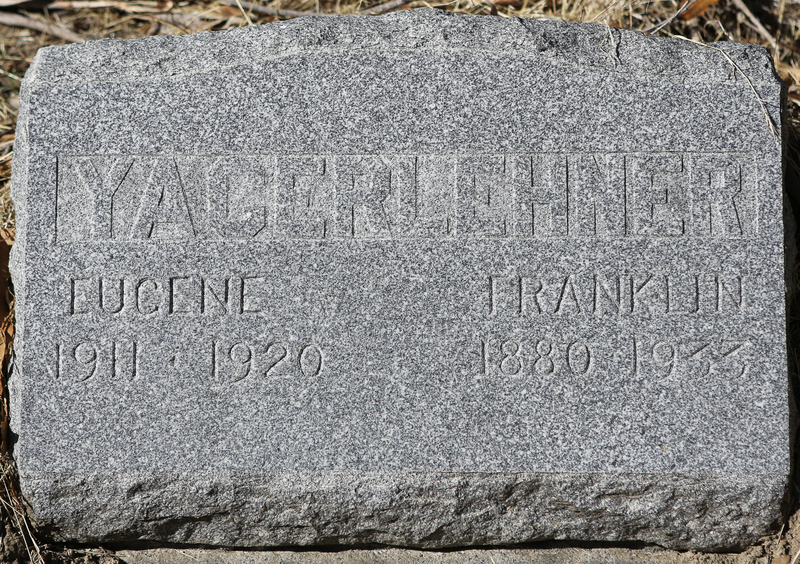 Franklin Yagerlehner was the son of John and Mary (Wright) Yagerlehner. He was born 9 November 1880 in Nine Mile, Allen, Indiana. He was the tenth of thirteen children. Frank married Lottie Lake on 23 December 1902 in Indiana. Because Frank worked for the railroad, the couple soon moved to California where they settled in Marin county. They had two children: Vera and Eugene. Eugene died young from an unknown condition. He had surgery to correct the condition but it was unsuccessful, and Eugene died soon afterwards in 1920 at age 8 years. Since Lottie remarried after Frank’s death, she is not buried with Frank but with her second husband, William F. Holbrook. Frank and Eugene are buried together at Mount Tamalpais Cemetery in San Rafael. 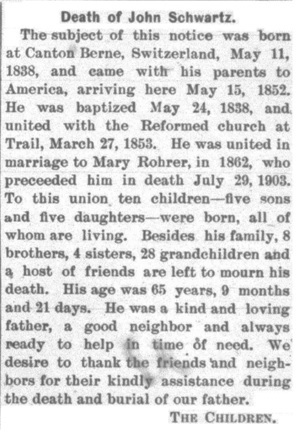 This entry was posted in Sunday's Obituary, Yegerlehner and tagged Eugene Yagerlehner, Franklin Yagerlehner, John Yagerlehner, Lottie (Lake) Yagerlehner Holbrook, Mary E. (Wright) Yagerlehner, Vera Jeannette Yagerlehner, William F. Holbrook, Wilson Yagerlehner on December 22, 2013 by Deborah Sweeney.